EATWELL is the healthy cooking and eating program that will move you from THINKING about healthy eating to CREATING nourishing dishes in smart, time saving ways. You'll get to see (and eat!) 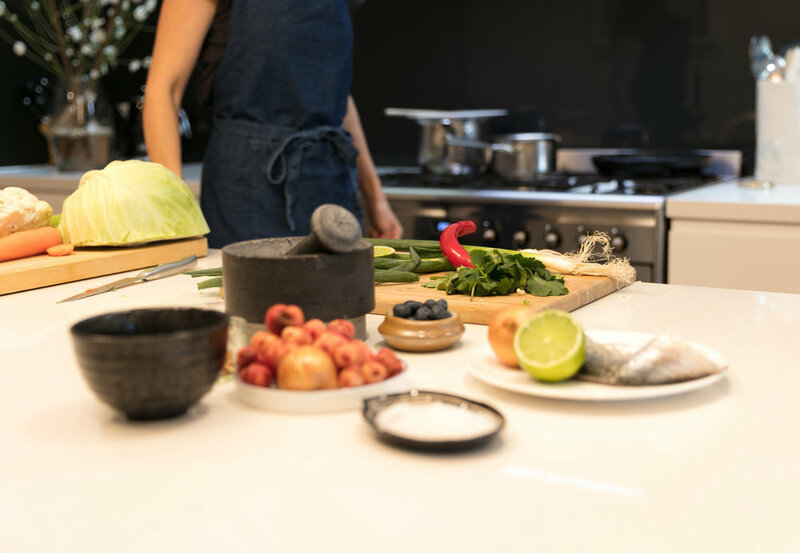 around 20 super nourishing and delicious dishes being created (organic or biodynamic where possible) which you can easily recreate at home as part of your personal EATWELL transformation. You get to sit back, relax and absorb what's happening in front of you, or get involved, it's up to you. You'll celebrate the many wins that stretch beyond the weekend. • Live cooking demonstrations & conversations tailored to help you adopt a smarter and healthier way of eating. Plus tips galore! Includes a follow-up chat and goal check-in with me. • Meet at the farmers' market for a one hour tour. • A focus on your goals and how to incorporate what you've learned into your new healthier life. Investment: 10 hours' education and transformational tips for life: $650 or *Early bird special $490 if payment is completed 14 days prior to chosen weekend. 'EATWELL has completely transformed my diet and my relationship with food. I'm now conscious of what I'm eating and I'm creating healthy dishes for the first time in my life. Caroline is not only an amazing chef, she is very motivational and makes everything seem super easy to recreate at home. Sessions in planning for London, France and LA mid-2018. Get in touch with me if you're interested! Spaces fill up quickly. You can reserve your seat by clicking the green contact button below.